It is beautiful out today! We’ve had a week or more of foggy, soggy mornings, and I am enjoying the gorgeous sunshine for once. Our hens gave me five eggs today. 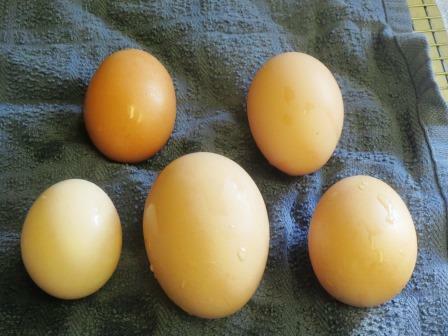 Generally, hens eggs weigh right around 2 ounces, but that big bruiser weighed 3.625! One of the hens was just squatting down to lay hers when I opened up the nesting boxes. I swiped it out of there before she even got a look at it. Talk about fresh! She spent a few seconds looking around, as if to say, “I could have sworn I just put something down here…” – and then she hopped out to go eat breakfast. 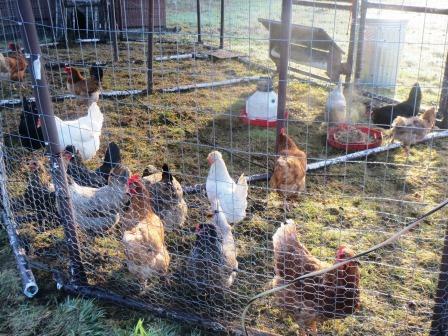 During the cold weather, we give the hens a hot ‘mash’, comprised of black oil sunflower seeds, chicken feed (both grain and pellets), kitchen scraps, all mixed with hot water. This is their favorite part of the day, and they will yell like crazy and mill around when they see me coming with the pan. Of course, when I returned with the camera, most of them had to run up to the wire and mug for me. But there were three that decided to forget the moment of fame when there was hot mash to be had! 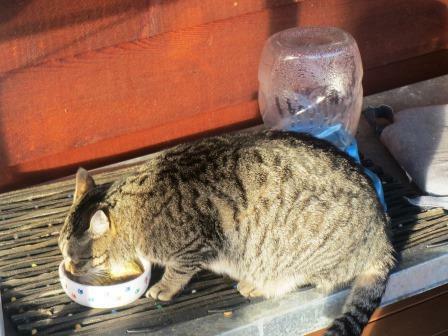 Pepper also enjoys a bit of warmed up food during the winter. We warm up a serving of his canned cat food each morning, and top it off with brewer’s yeast flakes to help keep his coat healthy and to keep the fleas away. He polishes it all off. I’m hoping to get a walk in today… this weather is too beautiful (and rare) to waste. This entry was posted in The Inmates, The Present Insanity and tagged brewer's yeast, cat, eggs, fleas, hens, hot breakfast, hot mash for chickens, nutritional yeast, warm cat food, winter morning chores. Bookmark the permalink.